Car magazine has the scoop on the upcoming 2012 Porsche Boxster model. According to the British mag's sources, the next-generation Boxster, also known as the 981, is being conceived almost entirely from scratch. The 981 will feature a new cab-forward design to better distinguish the model from the 911. Its dimensions will grow by 60 mm (2.36 inches) at the wheelbase and 37 mm (1.46 inches) in total length, while the height loses 10 mm (0.39 inches) and the front overhang is reduced by 25 mm (0.98 inches). The new cabin will provide more legroom, 18 mm (0.70 inches), for occupants of its two seats. Weight comes down too, by 15 kg (33 lbs) to 1320 kg (2904 lbs) for the standard model while the Boxster S will tip the scales at 1340 kg (2948 lbs). The Boxster will also feature some unique styling cues on its front and rear fascias, its own headlamps and taillights, a new side air intake design and a steeper windscreen. All making the model very different from the 911. But the real distinct factor will be a new flat-four power plant that Porsche is developing that will be a flagship engine of the next Boxster and Cayman models. The four-cylinder unit will displace 2.5 liters and feature a larger bore than on the current 2.9 liter engine. The 2.5 liter will be twin-turbocharged up to around the 360 bhp (268 kW / 365 PS) and 347 lb-ft (470 Nm) of torque mark. The 2.9 liter engine stays, with a bump in power from 252 hp (188 kW / 256 PS) to 265 bhp (198 kW / 269 PS) and 280 Nm (206 lb-ft) of torque. The 3.4 liter for the Boxster S will deliver 315 bhp (235 kW / 319 PS) and 360 Nm (266 lb-ft) of torque compared to the current 306 hp (228 kW / 310 PS). But Car magazine says the new 2.5 liter straight-four will come in various performance stages, which may mean it will eventually replace the 2.9 liter unit altogether. 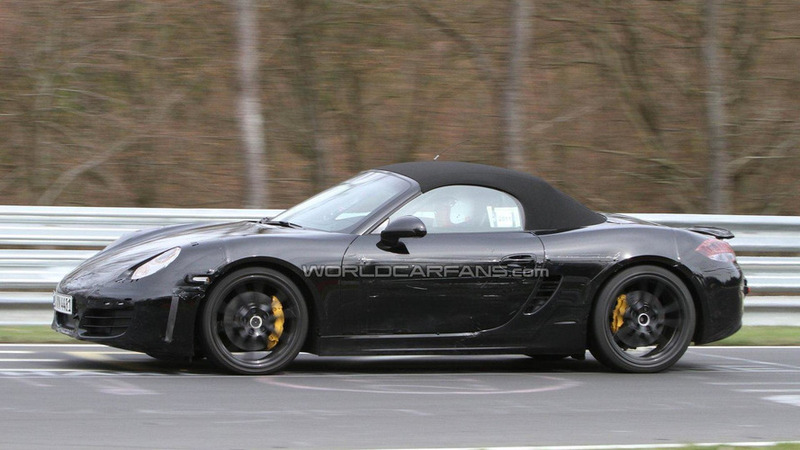 The new Boxster is scheduled for a debut at the Detroit auto show in January 2012.